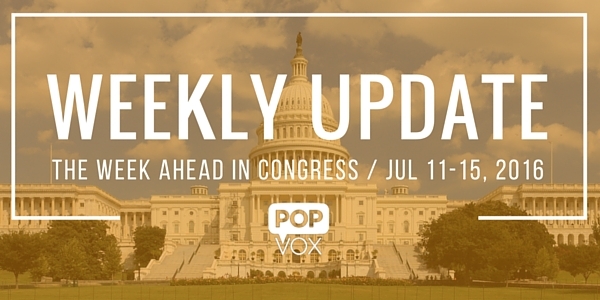 With a long list of bills, Congress is working to finish up its business before heading into the "August recess" (which begins next week). Of note: the House takes up the Senate-passed GMO labeling bill; bills to impose restrictions on Iranian sponsorship of terrorism, human rights abuses, and the ballistic missile program; increasing financial tools to combat terrorism. The Senate will work on the Defense appropriations bill. Congress is expected to send a 14-month FAA extension to the President before authorization expires on July 15. Before the summer recess, Congress must pass an extension for the Federal Aviation Administration, which runs out of funding on July 15. A 14-month extension is expected to be sent to the President this week. The House will consider the Senate-passed amendment to S. 764, the legislative vehicle for genetically modified organisms (GMO) labeling bill, by vote of 63-30. The bipartisan bill creates a national, mandatory standard for disclosing foods that contain GMO ingredients. It requires food containing GMO ingredients to be labeled using print, pictures, or scannable bar codes. It pre-exempts state labeling laws, such as Vermont law that required GMO labeling in grocery stores. To increase the rates of compensation for veterans with service-connected disabilities and the rates of dependency and indemnity compensation for the survivors of certain disabled veterans, effective December 1, 2016. H.R. 5640 authorizes the Secretary of Energy to undertake a $100 million basic research initiative in chemistry and material sciences for the purpose of advancing electricity storage systems. H.R. 5638 authorizes the Secretary of Energy to undertake a $100 million basic research initiative in chemistry and material sciences for the purpose of eventually developing solar fuel systems. This bill prohibits funds available to any federal department or agency for any fiscal year from being obligated or expended to purchase or issue a license to purchase heavy water produced in Iran. This bill applies to transfers of funds to or from Iran, or for the direct or indirect benefit of an Iranian person or the government of Iran, for a specified period only, the existing authorization for U.S. depository institutions and registered brokers or dealers in securities to process such a funds transfer if the transfer arises from, and is ordinarily incident and necessary to give effect to, an underlying transaction that has been authorized by a specific or general license and does not involve debiting or crediting an Iranian account. H.R. 5631 contains provisions to address state sponsorship of terrorism, human rights abuses, and the ballistic missile program in Iran. Provisions include:requirements for sanctions on members or affiliates of the Iranian Revolutionary Guard Corps (IRGC) and peopel who have provided material support to the development of Iran's ballistic missle program; special measures to reduce money laundering concerns; expanding the list of persons involved in human rights abuses; requirements for sanctions on the Supreme Leader and President of Iran, Iranian Ministers, and other government officials, individuals who participated in a terrorist attack or the kidnapping or politically motivated detention of a U.S. citizen, and financial institutions that engage in certain transactions on behalf of persons involved in human rights abuses or that export sensitive technology to Iran. Would amend the Investment Company Act of 1940 to terminate an exemption for companies located in Puerto Rico, the Virgin Islands, and any other possession of the United States. Under current law, the Securities and Exchange Commission (SEC) exempts certain securities from state regulation. H.R. 5421 would expand the exemption to allow any security listed on a national exchange that is registered with the SEC to be exempt from state regulation. To require the Secretary of the Treasury to direct the United States Executive Director at the International Monetary Fund to support the capacity of the International Monetary Fund to prevent money laundering and financing of terrorism. H.R. 5594 requires the President, acting through the Treasury Secretary, to develop and publish an annual government strategy to combat money laundering and terrorist financing. H.R. 5606 increases safe harbor provisions for information sharing among financial institutions and government agencies and broadens the range of suspected illegal activities. The bill requires the Secretary of the Treasury to submit a study to Congress that determines the appropriate level of information sharing with foreign subsidiaries within 120-days after enactment. H.R.5607 requires the Treasury Department to investigate ways to incorporate U.S. Embassies into counter-terrorism financing efforts, assess ways to improve anti-terror finance monitoring of cross-border fund transfers, and implement a program to enhance intergovernmental efforts to combat terrorist financing. The bill also adds the Secretary of the Treasury to the National Security Council. H.R. 5602: To amend title 31, United States Code, to authorize the Secretary of the Treasury to include all funds when issuing certain geographic targeting orders, and for other purposes. H.R. 5602 authorizes the Secretary of the Treasury to include all funds when issuing certain geographic targeting orders, including funds involved in an electronic fund transfer. H.R. 4983 would reserve $1 million from funding for the Department of Education to replace the current College Navigator website with a new website and change the type of information that the website would need to provide. The bill also would amend the requirements for the department’s net-price calculator, which provides details on the costs of post-secondary education. H.R. 5528 would reserve $3 million from funding for the Department of Education to implement changes to the application process for federal student aid. Those changes would include developing and testing a version of the application for mobile devices and continuing to develop the data retrieval system that allows students to pre-populate the online application with data from the Internal Revenue Service. H.R. 5529 would reauthorize the Developing Hispanic-Serving Institutions Program and expand the types of activities that institutions can support with the grant funds. The bill would authorize the appropriation of $108 million for fiscal year 2016. The underlying authorization for the program has expired but the Congress has already appropriated $108 million for those grants in fiscal year 2016. H.R. 5530 would amend the reporting requirements for the Historically Black College and University (HBCU) Advisory Board, which advises the Department of Education about the HBCU Capital Financing Program. It also would allow the department to provide financial counseling to HBCUs to better prepare them to qualify for that program. H.R. 5538 provides a total of $32.095 billion in total discretionary budget authority for the Department of Interior, the Environmental Protection Agency (EPA), and related agencies, for fiscal year (FY) 2016, a decrease of $64 million from the FY 2016 enacted level and $1 billion below the President’s request. The bill would end the "Chevron Doctrine," one of the most influential principles of administrative law, which requires that courts defer to an executive agency's interpretation of a law. The principle was established in the 1984 decision, Chevron U.S.A., Inc. v. Natural Resources Defense Council, Inc., 467 U.S. 837. H.R. 4785 would direct the Under Secretary of Management for the Department of Homeland Security (DHS) to oversee and manage vehicle fleets throughout the department. Currently, agencies within DHS (such as Customs and Border Protection) largely manage their own fleets. The bill would require the Under Secretary to monitor compliance with federal laws and regulations related to the use of government vehicles, develop a methodology to determine optimal fleet size, and approve vehicle leases and acquisitions. H.R. 4785 also would require DHS agencies to report data on vehicle use quarterly and submit fleet management plans, including cost-benefit analyses, annually to the Under Secretary. To make technical corrections to the requirement that the Secretary of Homeland Security submit quadrennial homeland security reviews. This bill directs the Transportation Security Administration to update the Transportation Sector Security Risk Assessment for the aviation sector, the Comprehensive Risk Assessment of Perimeter and Access Control Security for airports (as well as conduct a system-wide assessment of airport access control points and airport perimeter security), and the 2012 National Strategy for Airport Perimeter and Access Control Security. This bill requires the Department of Homeland Security (DHS) to develop and conduct an exercise related to the terrorist and foreign fighter threat in order to enhance domestic preparedness for and the collective response to terrorism, promote the dissemination of homeland security information, and test the U.S. security posture. DHS shall submit an after-action report, including any identified or potential vulnerabilities in U.S. defenses and requested legislative changes. The bill also amends the Post-Katrina Emergency Management Reform Act of 2006 to require the national exercise program to be designed to include emerging terrorist threats, such as such a scenario. The bill codifies the Presidential Innovation Fellows Program. To update the National Institute of Standards and Technology Act, and for other purposes. To increase the effectiveness of and accountability for maintaining the physical security of NIST facilities and the safety of the NIST workforce. H.R. 5252: To designate the United States Customs and Border Protection Port of Entry located at 1400 Lower Island Road in Tornillo, Texas, as the "Marcelino Serna Port of Entry"